Jens Munk was born on his father's estate Barbu at Arendal in the county of Aust-Agder, Norway. His father, Erik Munk, had received several fiefs for his achievements in the Northern Seven Years' War. However, his father had a reputation for his brutal rule over his estates which led to several trials. In 1585, he was deposed and imprisoned at Dragsholm Castle. At the age of eight, Jens Munk moved to Aalborg, Denmark with his mother who became a housekeeper in the home of her husband's sister who was married to the city's mayor. In 1591, at the age of twelve, Munk went to Oporto in Portugal where he worked for the shipping magnate Duart Duez. The following year he sailed with a Dutch convoy to Bahia in Brazil. Off the Brazilian coast, the convoy was attacked by French pirates. Munk was among the seven survivors. Munk lived in Bahia (today's Salvador) for six years, where he was in the service of Duart Duez' brother, Miguel. In 1599, under dramatic circumstances, Munk returned to Europe and Copenhagen, where the Danish magnate and Lord Chancellor Henrik Ramel hired him as a ship clerk. In 1609, he set sail with his partner Jens Hvid for the ice-filled Barents Sea. After two unsuccessful attempts to find the Northeast passage in 1609 and 1610, he caught the attention of King Christian IV. In 1612, during the Kalmar War (1611–13), Jens Munk together with the nobleman Jørgen Daa led a successful attack on the Swedish fortress Älvsborg, near today's Gothenburg. In 1614, he led a search for the privateer Jan Mendoses, whom he fought in a battle at Kanin Nos near the entrance of the White Sea. In the spring of 1617, he recruited eighteen Basque whalemen for the first Danish whaling expedition to Spitsbergen. In 1618, King Christian IV appointed him as commander of the first Danish expedition to East India with five vessels and almost 1000 men, but only one month before the departure of the expedition, Munk was relegated and replaced by the much younger nobleman Ove Gjedde. The reason for the relegation is unclear, but was most likely caused by a conflict Munk had with the Lord Chancellor, Christian Friis. Munk’s setback was compounded by the deaths of his brother Niels and good friend Jørgen Då. A few months earlier, Munk had also lost a vast amount of money as a result of an unsuccessful whaling expedition, which caused loss of social prestige. As an attempt to regain his social position, he started the planning of a much more spectacular expedition in 1619, the search for the Northwest Passage. On 9 May 1619, under the auspices of King Christian IV, Munk set out with 65 men and two of His Royal Majesty's ships, the frigate Enhiörningen (The Unicorn) and the sloop Lamprenen (The Lamprey). Both were outfitted under his own supervision. His mission was to discover the Northwest Passage to the Indies and China. His crew included Rasmus Jensen, Church of Denmark priest who is now recognized to be the first Lutheran cleric in Canada. Munk penetrated Davis Strait as far north as 69°, found Frobisher Bay, and then spent almost a month fighting his way through Hudson Strait. In September 1619, he found the entrance to Hudson Bay and became the first European to explore the western parts of bay. The expedition spent the winter near the mouth of what is now known as the Churchill River, a place Munk named Nova Dania (Latin for "New Denmark"). Cold, famine, and scurvy destroyed so many of his men that only two persons besides himself survived. With these men, he sailed for home with The Lamprey on 16 July 1620, reaching Bergen, Norway, on 20 September 1620. Later, a party of Indians returned to the shore of Hudson Bay where the expedition had camped. They found a number of unburied bodies of strange appearance and Munk's abandoned stores. Not knowing what gunpowder was, they set it alight and many of them were killed. Munk had planned on a new Northwest journey to take possession of Nova Dania (New Denmark) for the Danish crown, but his health was too weak to go on with it. In the subsequent years, Munk served as sea captain in the royal fleet. During the Thirty years War, Munk led a blockade on the River Weser in 1626 and 1627. Munk took part in the attacks on Wallenstein's troops at Fehmarn and in the Kieler Förde in March and April 1628. Munk died on 26 June the same year, probably as a result of being wounded in the battles in the Kieler Förde a couple of months earlier. According to the French scientist Isaac de la Peyrere, who served as a legate at the French embassy in Copenhagen, Munk died as a result of a dispute with King Christian IV, in which the king attacked Munk with his stick and thus caused his death. Munk was buried at St Nikolai Lutheran Church on the Baltic island of Fehmarn. An account of Munk's voyage to Hudson Bay in 1619-20 was published in Copenhagen in 1624 as Navigatio Septentrionalis; new editions by Awnsham and John Churchill (1704 ), An account of a most dangerous voyage peformed by the famous Captain John Monck, in the years 1619, and 1620; Peter Lauridsen (Copenhagen, 1883), Efterretning af Navigationen og Reisen til det Nye Danmark af Styrmand Jens Munk; and by C. C. A. Gosch, Danish Arctic Expeditions 1605 to 1620, volume ii. Hakluyt Society, No. xcvii (London, 1897). More recently there has been a popular book about him The Way to Hudson Bay: The Life and Times of Jens Munk (1969) by Thorkild Hansen. Hansen recovered a few remains of The Unicorn in the tidal flats of the river in 1964. A movie was made in 2015.A small scale archaeological excavation in 1964 by two Danes, Thorkild Hansen and Peter Seeborg, at Munk's site on the Churchill River found a few remains of the Unicorn in the tidal flats; they are now in the National Museum of Denmark. Jens Munk Island, located off the coast of Baffin Island, is named after him as is Munk Harbour at the mouth of Churchill River in Hudson Bay. The Jens Munk rose (Hybrid Rugosa Rose Jens Munk) was developed by Agriculture and Agri-Food Canada and was named in his honour. ^ "Jens Munk - Søfarer, 1579-1628". Jørgen Marcussen. Retrieved 2011-05-19. ^ "Jens Munk". Today's Canadian Birthdays. Retrieved November 29, 2015. ^ Mowat, Farley (1973). Ordeal by ice; the search for the Northwest Passage. Toronto: McClelland and Stewart Ltd. p. 95. OCLC 1391959. ^ Note: The Indians were either Chipewyan or Cree who both roamed this area at the time. See Kerry Margaret Abel: "Drum Songs: Glimpses of Dene History", p.32., McGill-Queen's Press (2005). ^ "Nova Dania Entries of Jens Munck" (PDF). American Birds. Spring 1986. Retrieved November 29, 2015. ^ "An account of a most dangerous voyage peformed by the famous Captain John Monck, in the years 1619, and 1620". HathiTrust. Retrieved 3 March 2019. ^ Thorkild Hansen: Jens Munk (Gyldendal, 1965). 391 s., ill.
^ "Jens Munk NordvestXpeditionen". Cineuropa - the best of european cinema. Retrieved 5 October 2017. Walter Andrew Kenyon: "The journal of Jens Munk, 1619-1620", Royal Ontario Museum (1980). Translation. This article incorporates text from a publication now in the public domain: Wilson, J. G.; Fiske, J., eds. (1900). "Munk, Jans" . Appletons' Cyclopædia of American Biography. New York: D. Appleton. Corley, Nora. T (1979) . "Munk, Jens Eriksen". In Brown, George Williams (ed.). Dictionary of Canadian Biography. I (1000–1700) (online ed.). University of Toronto Press. Churchill is a town in northern Manitoba, Canada, on the west shore of Hudson Bay, roughly 110 kilometres from the Manitoba–Nunavut border. It is most famous for the many polar bears that move toward the shore from inland in the autumn, leading to the nickname "Polar Bear Capital of the World" that has helped its growing tourism industry. Jens Munk Island is one of the Canadian arctic islands in Qikiqtaaluk Region, Nunavut, Canada. It is an uninhabited Baffin Island offshore island. Located at 69°39'N 80°04'W it has an area of 920 km2 (360 sq mi). Børsen, also known as Børsbygningen, is a 17th-century stock exchange in the center of Copenhagen. 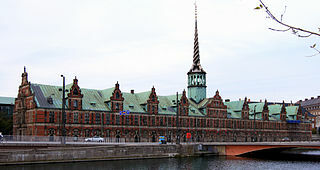 The historic building is situated next to Christiansborg Palace, the seat of the Danish Parliament, on the island of Slotsholmen. It is a popular tourist attraction. Børsen is most noted for its distinctive spire, shaped as the tails of four dragons twined together, reaching a height of 56 metres. Rasmus Jensen was a Danish Lutheran priest and the first Lutheran cleric in Canada. Danish Americans are Americans who have ancestral roots originated fully or partially from Denmark. There are approximately 1,500,000 Americans of Danish origin or descent. The Digges Islands are members of the Canadian Arctic Archipelago in the territory of Nunavut. The two islands, West Digges and East Digges, are located in Digges Sound, an arm of Hudson Bay, where the strong currents of the bay meet Hudson Strait.